Those who know even the basics of the history of video games can tell you that Tetris had a very strong influence in the video game industry. Amongst other feats, it redefined the puzzle game genre through the late 1980s and early 1990s. 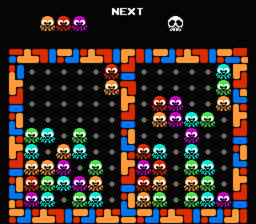 Many games attempted to ride on the coattails of Tetris' success. Klax, Dr. Mario, Columns, PuyoPuyo and countless other games were inspired by the concept of droping random junk into a well and organizing it in some manner. Some of these games were incredibly successful, but most were ultimately bland and uninspired. Not even the father of Tetris himself, Alexey Pajitnov, could develop anything remotely close to the resounding blast that his magnum opus brought to gamers around the world. However, this isn't a story of those other songs, be they the ones that held a tune or those that fell flat from the moment the melodies hit the first chord. This is about one song left unsung: a solo arrangement from Sunsoft, unveiled just as that company's spotlight was beginning to fade during the last days of the NES era. Pescatore is a puzzle game by Sunsoft intended for the Nintendo Entertainment System that, like Sunman, saw the light of day neither in the land of the rising sun nor the home of the brave. Nor even in places in between, as was the case with several other Sunsoft titles of the time. Unlike Sunman, however, Pescatore was briefly revealed to the public in spring of 1991 at Nintendo's Shoshinkai Show. The puzzle game was displayed side by side with titles such as Batman: Return of the Joker, Hebereke and Gimmick; the later two being later released in European markets as U*fouria: The Saga and Mr.Gimmick, respectively. Given the high quality of the games that Pescatore was sharing the stage with, it's understandable why this game was passed over for release, even in Japan. Pescatore incorporates a theme of quirky little sea critters with googly eyes and simplistic character designs over bland border designs and a black background. At first glance, it's easy to dismiss the game as a blatant ripoff of Compile's PuyoPuyo series. In fact, the gameplay in Pescatore borrows the gameplay from PuyoPuyo, changes the rules slightly to require less skill and more luck, and winds up making everything complicated and frustratingly random. Three-piece blocks of identical sea creatures of multiple colors fall from the top of the screen, with the object being to vertically, horizontally, or diagonally sandwich two or more creatures of the same color between two creatures of a different color. A row of creatures is cleared when the two or more creatures of the same color are encased on either end by two creatures of another color. All terribly interesting to say the least. The playing area is also depicted using dots. When a group of creatures is one creature away from being cleared, those creatures will animate and a dot will flash indicating where a creature of the appropriate color can go to clear the section. Pescatore offers several modes of gameplay, with the most interesting mode being Single Play. The player can choose what type of critter to use and what type of border to display, both of which are entirely cosmetic choices, and then a nonstop game begins. Single Play is the only mode in the game that features special effects pieces, which are the closest thing Pescatore has to an original gameplay feature. The special effect pieces that can be found in Single Play include a catfish, a frog, a female sea creature, and a cyclone. The catfish will loosen any floating pieces and cause them to fall toward the bottom of the screen as far as they can go, giving the player more room to work with and potentially clearing some rows. The frog will turn the entire playing area upside down and, like the catfish, will cause any floating pieces to fall to the bottom of the screen as far as they can go. The female sea creature, which is a purple version of whichever creature you chose when beginning Single Play, eliminates the horizontal row that it falls upon regardless of how many pieces are on that row. The female sea creature is the only controllable special effect piece. The cyclone is a bit of a mystery; it will clear some unfinished groups of sandwiched creatures, but it won't eliminate them all. Round Mode features a sequential stage structure in which the player must eliminate a given number of sea creatures in order to advance to a slightly faster stage. Fairly simple. As an added bonus, there is a charming intermission of dancing goldfishes between every two stages. After about six to nine stages, a simple credits screen is displayed and then the game restarts. This credits screen is also accessible by simply pressing Select at the title screen. Double Play is a typical two player mode. Gameplay is the same as in the other two modes, and is played in a last man standing versus match. Eliminating pieces will not affect your opponent, although a player may occasionally come across a skull block that cannot be eliminated. The appearance of these skulls seems to be totally random. Double Play only lasts one round, after which the game restarts. Very little is known about this odd bronze coin in the mix of jewels. It is possible that this early version of the game was incomplete and that additional features would have been implemented in a final version. For example, the special effects pieces that only appear in Single Play mode could have been implemented in other modes. Additional features could have also been added to Round Mode and Double Play, but that is purely speculation. To be completely blunt, though, there is no way to delicately elaborate upon and defend the mechanics and architecture of this game. While this was an early build, it's highly doubtful that tying up loose ends would have made Pescatore a success in the marketplace, especially considering the time period in which this game was revealed. Not only was the Super Nintendo Entertainment System on the horizon, but the marketplace was already oversaturated with other puzzle titles trying to capitalize on Tetris' success. Many of these games both looked and played better than Pescatore. In fact, Pescatore feels like it was developed much earlier than it was revealed to the public. Had Sunsoft released this game at or near the time it was displayed, the company would likely have taken a financial hit. It's unfortunate that Sunman was never released, and it's an utter shame that most gamers missed out on both Mr. Gimmick and U*fouria. But leaving Pescatore unreleased was probably a wise business decision. If Tetris is the Elvis of puzzle games, it's fair to say that PuyoPuyo is the U2. Where does this leave Pescatore? Had Sunsoft taken it all the way to release, it likely would have been the puzzle genre's equivalent of an off-key U2 cover band with a lead singer that repeatedly mangles Sunday, Bloody Sunday and never bothers to practice. Yes, Pescatore would have been that bad of a game. It not only tries to emulate PuyoPuyo while adding flashy gimmicks alongside a really bizarre change in the rules, it could potentially ruin the enjoyment one has when playing any given PuyoPuyo title. Needless to say, some songs are best left unsung. Download the Pescatore NSF here.